This time it was the United Center crowd Friday late in the Bulls 88-84 victory over the Los Angeles Lakers chanting “MVP, MVP,” which is getting somewhat tiresome around the NBA as I think I heard it the other day for Darko Milicic. After all, where would the Timberwolves be without him, other than Saturday in Chicago? The chants when the Lakers play are routinely reserved for Kobe Bryant. Though in the Bulls’ impressive comeback victory, it was a rising tide of acclaim surfacing for Derrick Rose, who led the Bulls with 29 points and nine assists and was the best player in the building, certainly on this night. Earlier in the day after the Lakers shootaround, Bryant shrugged off this notion that at 32 he is passing the mythical torch of excellence to the next crop of NBA stars, which includes Rose. And though no one’s game defines anyone or any team and Bryant’s legacy as the greatest in this era is beyond reproach, Rose Friday did the things Bryant once could do but likely not anymore and closed the game the way the rare, elite in the game can, scoring when it appeared no one else wanted to and no one else seemed capable. 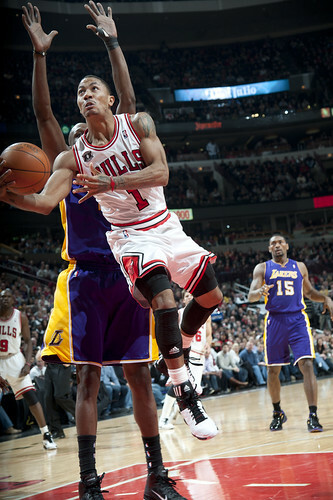 “Kobe, I look up to him,” said Rose, and you knew there was not a bit of insincerity in that. “If anything, what I take from his game is he knows when to put people away when you get the lead. He’s the best player in the game right now. He’s playing good, passing the ball great from double teams. 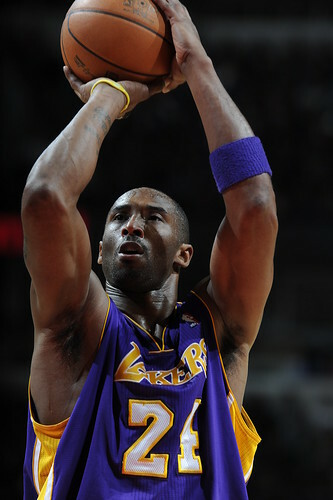 No, Kobe’s hardly done. He’s great. One game. One moment, you still want him. But the time comes, and it’s coming for Kobe as proud as he is. The kids are younger and faster and more capable, if not more savvy. Kobe’s hardly done and I wouldn’t be surprised if he collected a few more titles. But I don’t expect as many highlights. I remember early in Michael Jordan’s career when Julius Erving came into the old Chicago Stadium one day and he knew. We weren’t sure. Kobe knows, though he is too proud to even admit it. Like Jordan, he’ll be saying at 46 he still could take those kids. But the stuff that Rose does now, well, that’s the stuff of memory for Bryant. Perhaps Rose doesn’t know the game as well, how to draw the foul, beat the double with less effort, save his energy for the right moments. He’s just a wild stallion now and beautiful to watch. Bryant had 23 points and seven assists for the 16-7 Lakers, though he shot seven for 23 against pretty good defense, first from Ronnie Brewer and then Luol Deng. Unlike last month in Los Angeles when Bryant burned the Bulls down the stretch as they doubled and vainly tried to rotate back, the Bulls singled up well, especially Deng, and then brought a late double when Bryant was into his move. It’s the way for the Bulls not only to play Bryant but how to play. They are a poor double team-and-recover team because they have so few athletes other than Rose. 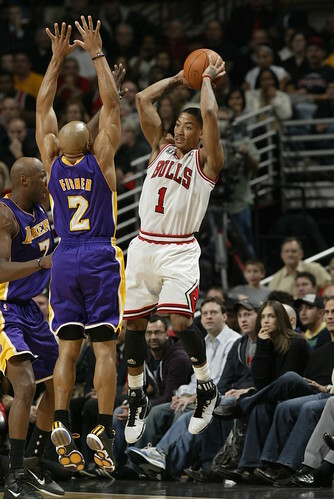 Though the Lakers played a bit into the Bulls hands down the stretch, though it was probably necessary when the Bulls pulled ahead 81-69 with 4:38 left with Rose and Kyle Korver, the latter with 13 points off the bench, carrying much of the scoring load. 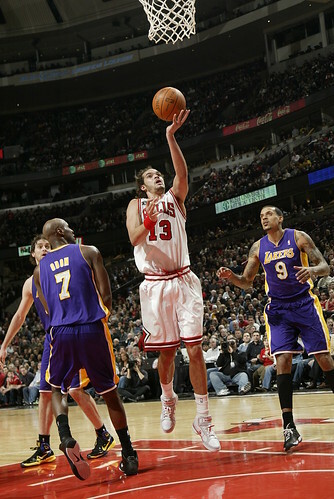 Earlier in the game when the Bulls had another miserable start and the Lakers catapulted out to a 22-9 first quarter edge, Pau Gasol and Lamar Odom were punishing the Bulls interior with 18 of those 22 points. It looked like it would be a brutal night for Joakim Noah and Carlos Boozer. The Bulls dig themselves out of that hole, not even one of their bigger, early ones this season as they’ve trailed by 20 some a few times. 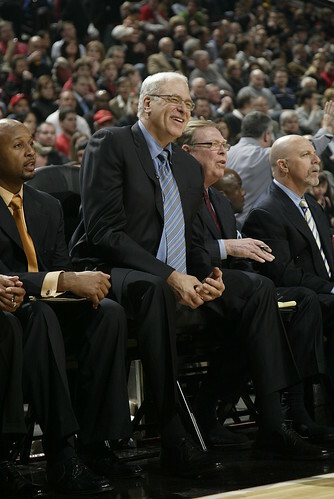 But by climbing back up late in the game, Lakers coach Phil Jackson, the Bulls coaching legend who likely was making his final coaching appearances against the Bulls (unless they meet in the Finals) in probably his final NBA coaching season, had to go back to his most effective scorers, Gasol and Odom. But by doing so, the Bulls were able to double much easier. Generally, their doubles come off big guys, so when they went late on Kobe the Bulls didn’t have to come as far and could show with long arms up, especially Noah. 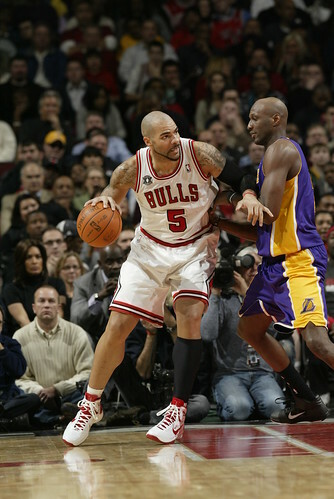 Last month when the Lakers pulled away from the Bulls, the Lakers were playing small with shooters spreading the court, so when the Bulls automatically doubled Kobe, the player doubling had no chance of getting back as Kobe has become such a great passer in finding open players and the Lakers shot the Bulls out of the game. Bulls coach Tom Thibodeau was mindful this time and mostly stayed with one defender on Bryant, and then doubled late or when he could use a big man who didn’t have to go far, and perhaps the point was the Bulls were able to control Bryant. The Lakers threw two, three and even four defenders at Rose, especially on that last Rose score late that looked like a running back in the NFL reversing field against an entire defense. Like one of those Devin Hester improbable runbacks and Hester courtside with the likes of his coach Lovie Smith Blackhawks stars like Patrick Kane and the White Sox’ Kenny Williams probably could even take some inspiration. No, it wasn’t just another game or another win, the fourth straight, for the 13-8 Bulls despite what the coaches might say. Sure, everyone said you can’t let down Saturday against the Timberwolves, but this one mattered more than one game, especially with recent losses to Boston and Orlando. “Do you know how bad after a win like this I want to hit the streets and enjoy this in Chicago. I’d love to do that,” said Noah. “But you’ve got to focus and understand Minnesota is coming tomorrow and they don’t care who you beat. It was a terrific victory for a young team trying to find and prove itself, but it was not happening without Rose. It wasn’t a particularly sharp game with a brutal 36-32 Bulls first half featuring 22 combined turnovers. But it was an exquisite finish. The first highlight came with 5:31 left, an out of bounds play with three seconds on the shot clock. 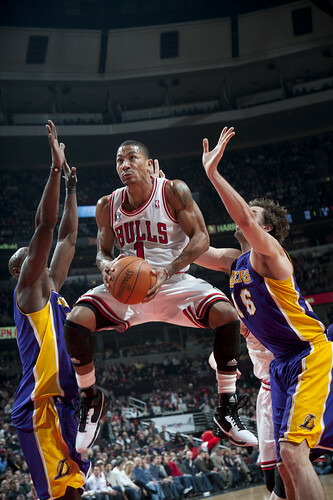 Rose darted to the right corner followed by Shannon Brown with Kobe Bryant in the neighborhood on defense against Deng. 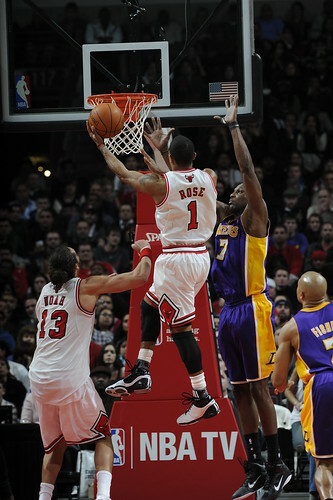 Rose went up, one of those “He’s still going up when everyone else is coming down” jumps with Rose’s waist over the top of Bryant’s head. Rose flicked in a three (later changed to a two) for a 77-67 lead and then gestured open handedly, arms apart, signaling either to the official he was fouled, to the crowd in a “can you believe that?” or to pose for LeBron’s witness picture. I was convinced it was toward the official, though since that can be a fine, Rose said it was to the crowd, though we are becoming witnesses to something. 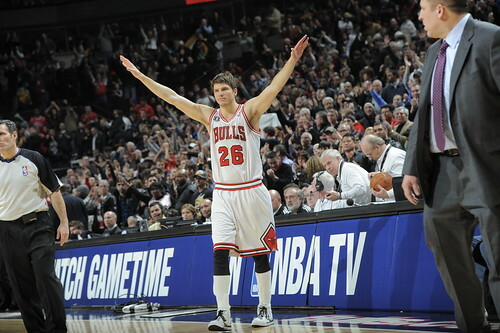 Korver then cashed in a three on a penetrate and kick check Rose wrote, and after two Korver free throws the Bulls led 81-69 with 4:38 left. Though there wasn’t much talk about it, and none from Deng for obvious reasons, just after that Bryant drove from the right side and caught Deng with a vicious elbow that knocked out a wisdom tooth in the deep right corner of Deng’s mouth. 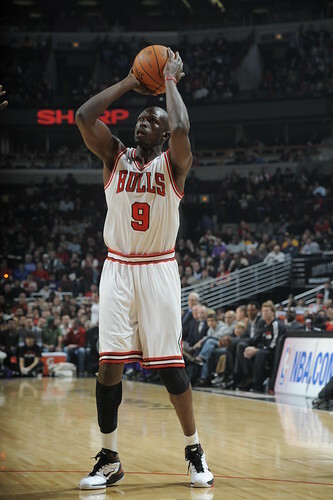 Deng lay stretched out for a few minutes, but stayed in the game and continued to be the principal individual defender against Bryant. “And they call the foul on me,” laughed Deng afterward as his mood was brightened by the win, if not the prospect of some dental work. 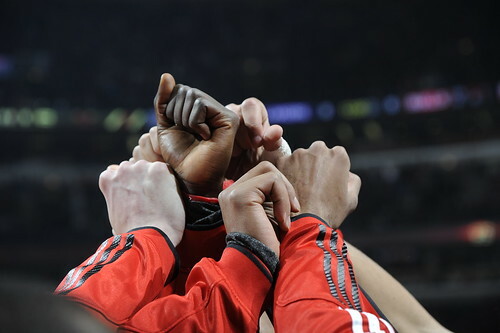 But the Bulls had their teeth into this game and, at least Rose, wasn’t letting go. You never count out a team like the Lakers, and Bryant can be that set up man more often now as he has a vastly superior team to the Bulls’. Gasol is likely the league’s best center for his overall skill level, Odom was a star for USA Basketball this summer and playing at an All Star level, and the bench is much improved. Gasol scored in the lane on a dive cut off a pass from Bryant, Matt Barnes went backdoor on Korver for a layup and Bryant dropped a driving pass off for Odom for a layup. 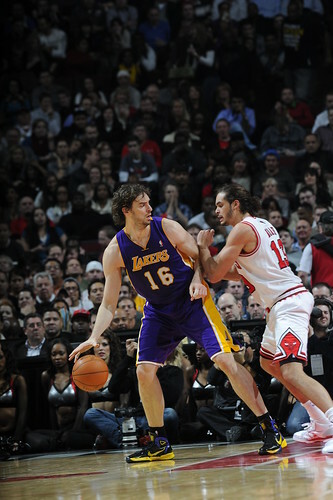 Meanwhile, the Lakers were tightening up and Korver was shooting from too far out and Noah was forcing a drive. Noah has been finishing somewhat weak of late with more of his shots flips and dinks that are being swatted away or grabbed more easily than when he was dunking earlier in the season. 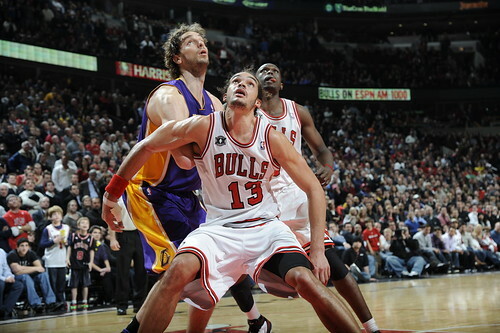 So, suddenly it was 81-77 Bulls after a Bryant drive as the Lakers were trapping Rose to get the ball away from him. It was like one of my favorite plays that came late in the first quarter. The Bulls opened terribly once again, another troubled start for Keith Bogans, about whom Thibodeau has been getting defensive with fan and media questions about changing the starting lineup. And, true, Bogans hardly gave up all those Gasol and Odom layups, but at least on offense the Bulls have had some trouble running early pick and rolls as Bogans’ defender generally leaves him and doubles in the lane, disrupting the interior movement. Still, plenty of guys were to blame, and you could see Rose, whose shot was off, having had enough. Taj Gibson, who was scoreless in 13 minutes, missed a jumper and Rose went in over Gasol, grabbed the rebound and put it back to get the Bulls within 22-11. Sure, a long way to go, but also a message from Rose. The Bulls did get back into it with a rush of Deng and Korver shots late in the second and the Lakers scoring just 10, and then a pair of Rose threes to highlight a late third surge to a 66-58 Bulls lead after three. 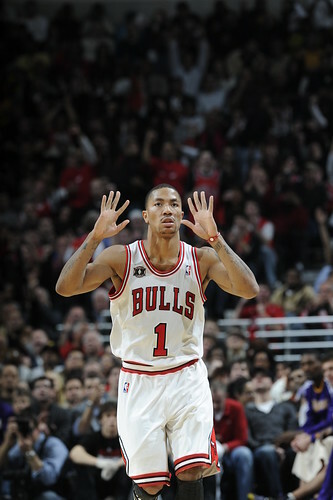 The Bulls, of all teams, were eight of 17 on threes and the Lakers three of 13, and we know that rarely happens. And Phil loves to tweak Gasol about being soft. Perhaps, though, not for much longer. Jackson has talked Brett Farve-esque for a few years about walking away as he’s now 65. He did say at Lakers’ shootaround this was the last time he’d coach in Chicago, though we know guys change their minds. But Jackson did make a point before the game of going around to former players of his with the Bulls like broadcasters Bill Wennington and Stacey King, offering thankful handshakes which seemed to suggest perhaps this time he was serious. But if Phil was signaling he was going, here down the stretch were the Lakers coming and no one other than Rose seemingly able to get anything going. Coming out of a timeout with 2:12 left and ahead 81-75, Rose found Noah open on a cut. But Noah after slipping a screen when Gasol went to double Rose dropped the ball out of bounds. 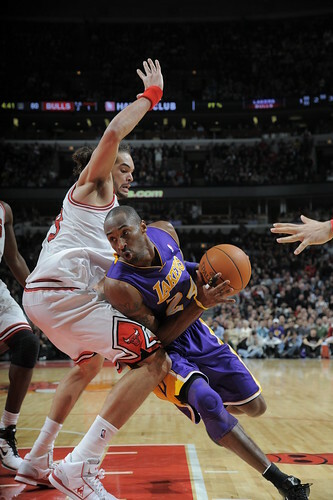 So it was another Rose “get out of my way” moment with the Bulls now hanging on 81-77 with 1:45 left after a Bryant driving for eight straight Lakers points. Rose beat Fisher right, went left as Gasol tried to close and then finished over Odom at the rim for a lay-in. Derek Fisher then knocked down a three to pull the Lakers within, uh oh, 83-80 with 48.4 seconds remaining after Gasol blocked a Noah dunk try. And here came Rose. This one was remarkable. Rose drove right past Fisher, reversed field and then left past Barnes and Gasol and then stepping back a bit to avoid a stepping up Bryant, Rose hit a 15 footer with 26.2 seconds left for an 85-80 lead. That one was so good, Rose got his head cupped and rubbed by Boozer as he went back to the bench and even a fist bump from the usually laconic assistant Ron Adams. 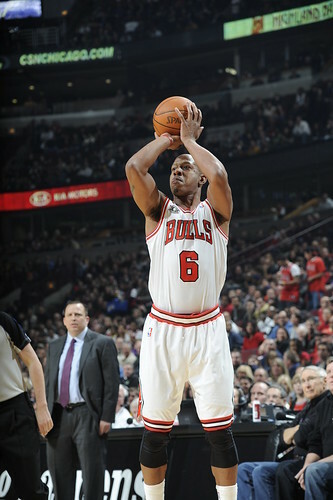 The Bulls closed it out with a few free throws, an MVP type of win.